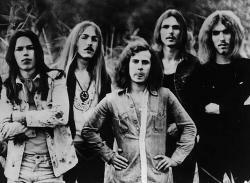 Scorpions are a German rock band formed in 1965 in Hannover. Since the band's inception, their musical style has ranged from hard rock to heavy metal. The band's only constant member is guitarist Rudolf Schenker, although Klaus Meine has been the lead singer for all of their studio albums, and guitarist Matthias Jabs has been a consistent member since 1979. Their songs include their 1980s hard rock anthems "Rock You Like a Hurricane" and "No One Like You", and other successful singles such as "Send Me an Angel", "Still Loving You" and "Wind of Change". The band was ranked number 46 on VH1's Greatest Artists of Hard Rockprogram. "Rock You Like a Hurricane" is also number 18 on VH1's list of the 100 Greatest Hard Rock Songs. They are one of the world's best selling music artists of all time, with reported sales of 75 million records worldwide.